When it comes to settling down into a place you can call home, life offers you a lot of choices. You can select a community that offers the most living amenities, or you can choose the community that offers you an ideal location. It is rare when you find a neighborhood that can offer both things. Brunswick Forest is a master-planned living community that offers it all. Real Estate Scorecard, an industry leader of online real estate reviews, recently began its new awards segment “Happiest Communities in America.” Residents from master-planned communities across the Southeastern United States will vote and share what makes their community the best place to live. As of 2019, Real Estate Scorecard monitors over 406 master-planned communities in both the Southeast and Central America. We believe there is an abundance of reasons that make Brunswick Forest a serious contender to be the happiest community. Brunswick Forest gives you ample lifestyle choices including yoga, cardio classes, art classes, community clubs, championship golf, pickleball courts, tennis courts, pools, spas, and social events. 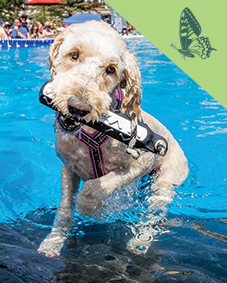 Our community is committed to promoting both active and relaxed lifestyles. We have biking and walking trails that are great for exercise, or a casual stroll with neighbors. The Brunswick Forest fitness center offers a full staff that is always ready to cater to your health and well-being. When it comes to location, Brunswick Forest ranks as one of the best communities in the Southeast. 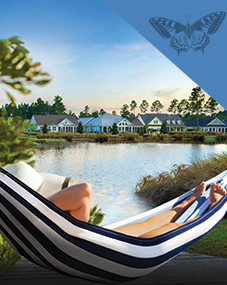 When we say, “our community prides itself on being Coastal By Nature®,” we mean it! Historic Downtown Wilmington and the most pristine beaches on the east coast are just minutes away. These locations are rich with history, dining and shopping. Our own shopping center, The Villages, has a multitude of shops and professional services for your convenience. This centralized location is why our residents have a quality of life that is second to none. Southeastern NC is something that attracts homeowners from miles around. The seasons bring mild winters, warm springs and long summers. The climate at Brunswick Forest allows you to focus on the enjoyable things in life. Brunswick Forest offers quality living, a great location, amenities and a desirable climate. A lifestyle that gives you more for less, and a collection of neighborhoods to meet every taste. 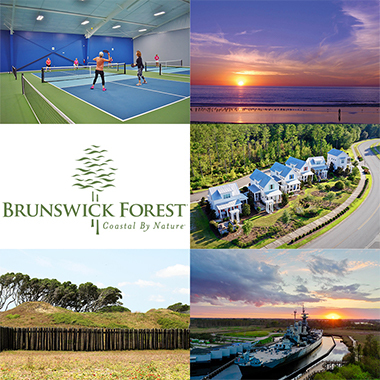 At Brunswick Forest, you can have it all. With so many advantages, what’s not to be happy about?